The Birmingham Civil Rights Institute (BRCI) is a modern museum that serves as a connection to the Birmingham Civil Rights National Monument, a collection of sites important to the Civil Rights Movement. 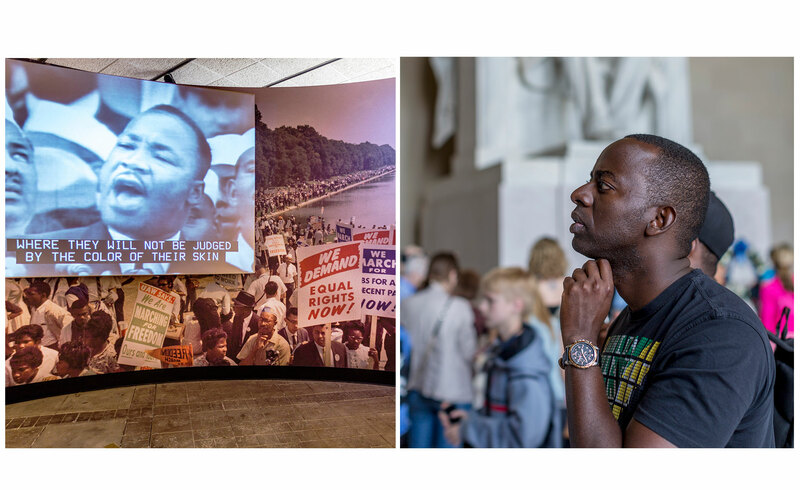 Visitors can experience a rendition of a segregated city in the 1950s, as well as examine a replica of a Freedom Riders bus and even the actual jail cell door from behind which Dr. Martin Luther King Jr. penned his famous “Letter From Birmingham Jail.” The institute is also home to an expansive archive of documents from the Civil Rights Movement and nearly 500 recorded oral histories relevant to the period. On left-part of a civil rights exhibit in the Institute. On right-A young man contemplates the engraved words of Abraham Lincoln at the Lincoln Monument in Washington D.C.